Hi there! Today’s post is the last post this week – so it’s the last post this nail week. 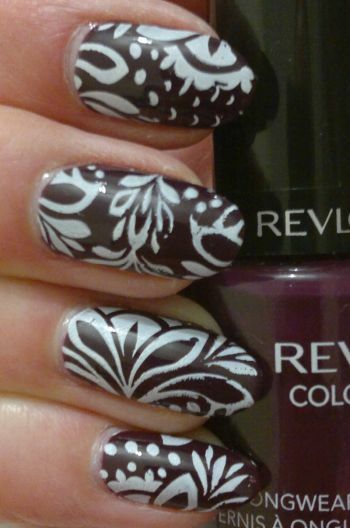 For this mani I painted my nails with Revlon 260 Bold Sangria (2 coats). I think Bold Sangria is one of the best dark purple polishes out there. Great quality, lovely shade! Thanks, Revlon! And I used Essence’s white stamping polish and Pueen’s 51 plate (which is part of Pueen’s Stamping Buffet collection) to stamp floral images onto my nails. However, in real life the mistakes were hardly visible. Well, in real life no one stares at my nails and no one’s looking for mistakes. 😉 And I did get a few compliments on this mani, so it wasn’t too bad. Like I said, this is the last nail post this nail week. I haven’t done a weekly recap post today, so if you think you’ve missed a post or if you’d like to see the other manis I’ve written about this week (or ever…), click here and scroll down. I’m back with a “regular” post tomorrow. So in the meantime… Happy Sunday! Hi there! Today’s post is about a mani I tried in December. It was supposed to be some kind of a Christmas tree mani – but unfortunately it didn’t really look christmassey at all. 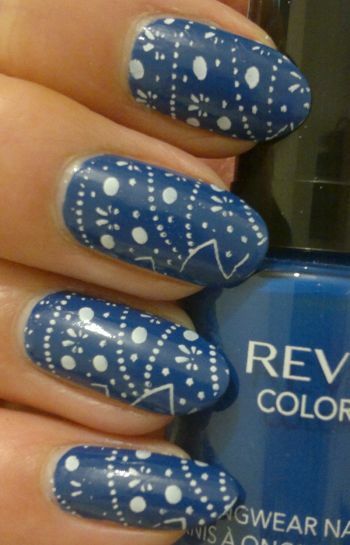 For this mani I painted my nails with Revlon Colorstay 180 Indigo Night (2 coats). I like this polish very much because the formula is easy to work with and this polish is almost a one-coater. 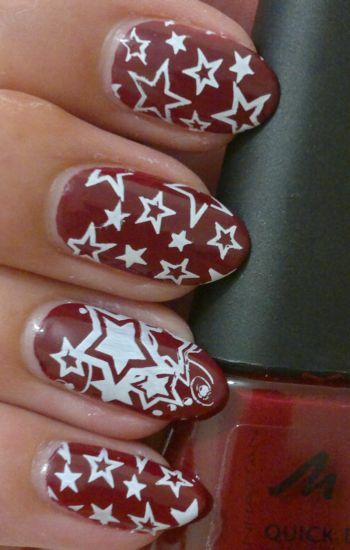 I used Essence’s brilliant white Stampy polish to stamp on the Christmas tree images. The stamping plate I used is a no-name plate. I think this mani looked quite OK – but it didn’t really work out as a Christmas mani. So from this point of view it’s a partial fail. Hi there! I’ve got another nail post for you today. 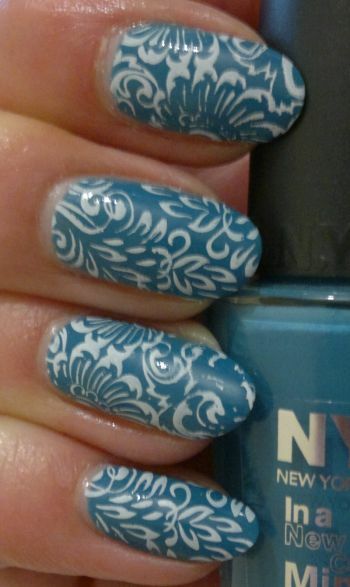 For this mani I painted my nails with NYC In A Minute 296 Water Street Blue (2 coats). I used Essence’s white stamping polish to stamp on the floral images. The stamping plate I used was Pueen’s 76 plate which is part of Pueen’s Buffet Leisure collection. Hi there! I’m continuing with the 31 Days Nail Art Challenge, and today’s post is about Red Nails (Nail Art Challenge #1). For this mani I painted my nails with Boots No.7 Devil’s Delight (two coats). I like the formula of this polish. It’s perfect. And the No.7 brush (wide, flat) is great too. If you know me, you know I can’t just paint my nails and leave it at that. And I think the Nail Art Challenge is worthy of more than just plain red nails. So I decided to stamp! I chose a cute image from Pueen’s 77 plate (which is part of Pueen’s Buffet Leisure collection). The white stamping polish is Essence’s fantastic Stampy Polish. 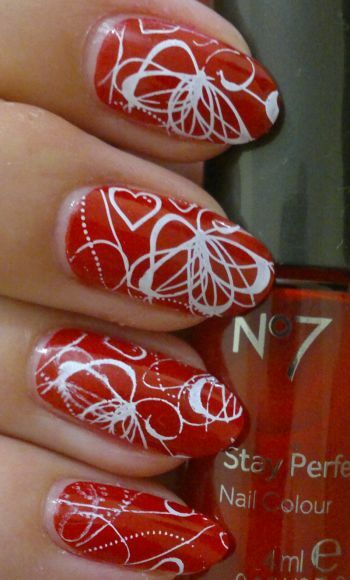 I’m pleased with this mani and I really like the red and white colour combination. Do you agree? Feel free to let me know what you think. Oh, and the next mani might be ‘inspired by fashion’ (I’m thinking of something…) so let’s see how it goes! And thanks for reading! I painted my nails with Manhattan Quick Dry Nail Polish 46K (two coats). I really liked the creamy dark red colour and I was pleased that the polish dried quickly. Many quick dry polishes are dry to the touch in no time, but they still take a while to dry completely. This one didn’t take long. Fantastic! The stamping plate I used is Pueen’s 44 plate from Pueen’s Love Elements stamping collection. I opted for two different images featuring stars. And I stamped these on with my white Essence Stampy Polish. I really liked this mani because it was easy to do and it looked quite cute. 🙂 What do you think? Do you agree? Feel free to let me know. And thanks for reading! Hi there! This is another mani I did recently. I painted my nails with Essence The Gel Nail Polish 33 Wild White Days (pinky), Rimmel 60 Seconds 503 Mind The Gap, Victoria (ring and middle fingers), and B. Complete 154 Brit (index finger, thumb). 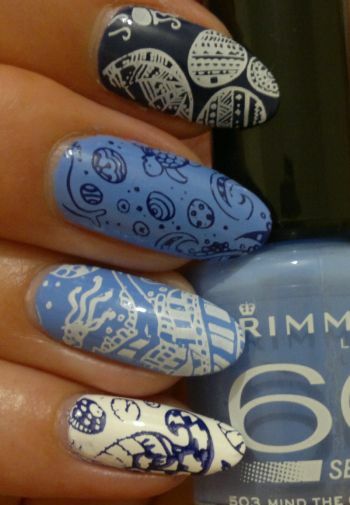 I didn’t know what to do with the white & blue mani – I didn’t feel inspired at all. So in the end I opted for an underwater mani. I used Essence Nail Art Stampy Polish in White (ring and index finger, thumb) and Filthy Gorgeous Midnight (pinky, middle finger) to stamp on images from Moyou London’s Doodles 07 plate. Unfortunately I smudged the image on my pinky. Not sure how it happened. But all in all I like this mani. In regards to the polishes I used, I found the Rimmel polish to be amazing. The formula was perfect and it applied like a charm. Brilliant! The B. polish wasn’t great. It took ages to dry and I had to apply three coats. The B. polish was also prone to chipping, so within 24 hours I had to ‘fix’ all the nails I painted with this polish. Not great. However, I was pleasantly surprised that the B. polish didn’t stain at all when I removed it. The white Essence polish is alright. It really is opaque in two coats. But it takes a while to dry and the formula is on the goopy side. Feel free to comment if you wish. And thanks for reading! I painted my nails with Rimmel Salon Pro 444 Seduce (pinky, middle finger, index finger, thumb) and MUA White Wash (ring finger). I wanted to stamp white on purple and purple on white. 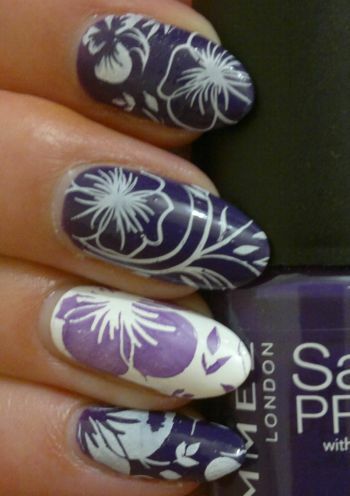 So I used Essence’s fantastic white stamping polish – and Rimmel 444 Seduce. The exotic floral image is from Pueen’s 72 plate (from Pueen’s Stamping Buffet collection) which is one of my favourite plates. All in all, I’m happy with the mani. Yes, it’s unfortunate that the purple polish didn’t stamp very well. However, I can look past that. 🙂 Feel free to let me know what you think and thanks for reading!